Will Death Valley Top 130 Degrees? Here's Where To Watch : The Two-Way The highest air temperature ever recorded on the planet was the 134 degrees registered there in 1913. Forecasters say the heat wave baking the Southwest could push the temperature near that point in the valley this weekend. 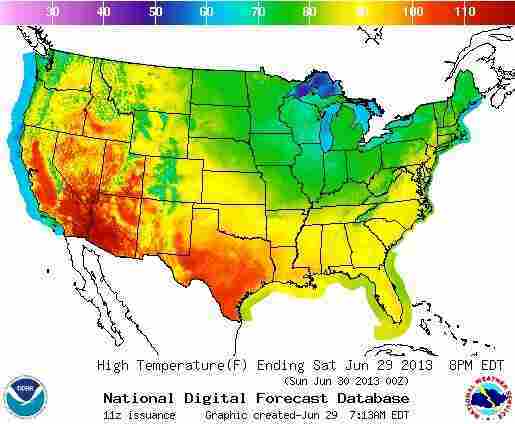 We can't do anything about the oppressive heat wave that's cooking states across the nation's Southwest. -- Stay inside if you have air conditioning. Go to a library, store or cooling center if you don't. -- Stay hydrated and avoid alcohol and caffeinated drinks. -- Slow down. This isn't a time to be outside exercising. -- There's this National Weather Service page that's being updated with readings. As of 5:10 a.m. local time Saturday (8:10 a.m. ET), the temperature was 98 degrees. -- And The Atlantic Wire has created a little graphic that it's updating with the same information. That 134-degree reading -- the highest "reliably recorded air temperature on Earth" — was registered on July 10, 1913.